This edition is for comprehensive 3 unit courses. A Concise Edition is also available. If you are considering this text for possible adoption in your course, and would like a complimentary copy of new 7th Edition, I can expedite a copy from the publisher and have it sent to you as soon as it is available. What is the title of the current text you are using? What's New in the 7th Edition? Rigorous scientific support for learning styles is lacking. Current research in neuroscience suggests that we learn best by using all the senses. Learning preference depends on what we are learning. See my blog with presents the research on this issue, "Are Learning Styles a Myth? If So, What's Next?" The MI Advantage assessment of multiple intelligences is now included. It suggests careers based on multiple intelligences and provides links to the O*Net database of careers for research. Practical strategies based on the latest findings in neuroscience are provided for improving memory and study skills. Math is the most failed subject in college and it is the gateway to high paying scientific and technical careers. There is added emphasis on how to study math, taking notes in math courses, math anxiety and taking tests in math. Discover their strengths, interests, and values. Think positively about themselves and their future. Clarify what happiness means and work toward attaining happiness in life. Information on positive thinking and fixed mindsets is included. Topics include college, career, and lifelong success. Topics include motivation, positive thinking, locus of control, mindset, future-mindedness, hope, belief, persistence, emotional intelligence, and learning positive behavior. The suggested strategies in this textbook are all based on current research. The latest research in neuroscience is translated into practical strategies for memory and study skills. The career material in the online portfolio helps students to make an informed choice of their college major and career. It includes the Do What You Are (DWYA) personality assessment and the MI Advantage assessment of multiple intelligences. The results of these assessments are linked to the O*Net database of careers for career exploration. It includes Simply Hired which helps students to find employment. The material in the online portfolio is supplemented by The Interest Profiler integrated into Chapter 3 which helps students to identify their vocational interests. information on career trends, the career decision-making process, educational planning, researching career information, and career outlook. updated job search strategies, including the concept of online personal branding and using social media to find jobs. the basics of writing a resume and cover letter as well as interviewing tips. Since math is the gateway to high paying careers and is a challenging requirement for graduation, this edition has expanded material on how to study math, take math notes, deal with math anxiety, and how to be successful on math tests. Interactive activities within the text help students to practice the material learned. Frequent quizzes and answer keys within the chapters help students with reading comprehension and check understanding of key concepts. Journal entries help students think critically and apply what they have learned to their personal lives. Individual and group exercises are included at the end of each chapter. 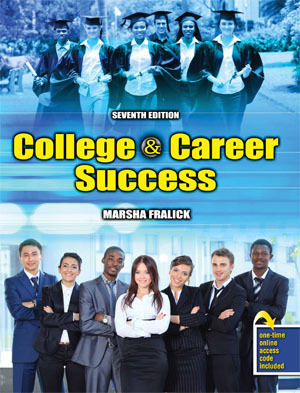 The College Success 1 website at www.collegesuccess1.com has additional materials to accompany this textbook. Student resources include key ideas, Internet links related to each chapter, and Word documents for the journal entries. Resources for faculty include the Instructor Manual and Faculty Resources for teaching college success courses including over 500 pages of classroom exercises, handouts, video suggestions, Internet links to related material, and much more. Download this document: Student Learning Outcomes, Objectives and Assessment for the new 7th Edition. Download this document: Student Learning Outcomes for Your Syllabus for the new 7th Edition. It is a brief statement of the learning outcomes. Topics include the value of a college education, how to choose a major, how to be motivated, using a growth mindset, developing habits that lead to success, and the value of persistence. Topics include choosing a major that matches your personal strengths; understanding personality types; personality and preferred work environment, decision making; time and money management; career outlook; and finding your passion. The Do What You Are personality assessment is included. Suggested careers are linked to career information in the O*Net database of careers. Topics include exploring multiple intelligences, exploring interests, using values to make important decisions, and decision-making. The Interest Profiler which measures vocational interests is included along with the MI Advantage which assessess multiple intelligences, suggests matching careers and provides links for career inresearch in the O*Net database of careers. Topics include employment trends, work skills for the 21st Century, career research, educational planning, personal branding online, updated job search skills, the resume, interview skills and finding success in adversity. Topics include lifetime goals, using priorities, estimating study and work time, schedules, time management techniques, dealing with procrastination, and money management. Topics include improving your memory, practical memory techniques based on brain science, using mnemonics and other memory tricks, optimizing your brain power, and positive thinking. Topics include neuroscience and practical learning strategies, applying memory strategies to reading, how to be successful in your math course, and creating your success. Topics include taking notes on the college lecture, note taking systems, improving note taking efficiency, reviewing your notes, power writing, and the basics of public speaking. Topics include test preparation, dealing with test anxiety, studying for math tests, tips for taking tests, and how to prepare for tests. Topics include understanding your communication style, communication for success, the language of responsibility, barriers to effective communication, dealing with conflict, friendships, roommates and relationships. Topics include fallacies in reasoning, how to become a critical thinker, moral reasoning, and creative thinking techniques. Topics include longevity, nutrition, exercise, avoiding addictions, avoiding sexually transmitted infections, protecting yourself from sexual assault, getting enough sleep and making positive changes in your life. Topics include the importance of appreciating diversity, vocabulary for understanding diversity, the human genome, communicating across cultures, understanding sexual orientation, how to appreciate diversity, stages of ethical development and student perspectives on diversity. Topics include life stages, positive thinking, optimism, hope, future-mindedness, positive self-talk, affirmations, successful beliefs and secrets to happiness. An interactive online edition is available, College and Career Success Online. Contact Carla Lundman at carlal@humanesources.com for an online demo. The Instructor Manual contains over 500 pages of interactive exercises, classroom handouts, and techniques for engaging students in learning. Here is a sample of the Instructor Manual for Chapter 1: Understanding Motivation. The Test Bank includes a bank of questions for each chapter as well as section, mid-term and final exams. The PowerPoint Library contains a slide for every topic in the textbook. Select the slides that match your student learning outcomes. Here is a sample PowerPoint presentation for Chapter 1: Understanding Motivation. Note that a user name and password are required to access the full Instructor Manual, Test Bank and PowerPoint Library. Login information is provided for faculty who have ordered textbooks for their students. If you have ordered texts, contact me at marsha@marshafralick.com for the login information.